in the world.InPhilanthrocapitalism, Matthew Bishop and Michael Green examine this new movement and its implications. 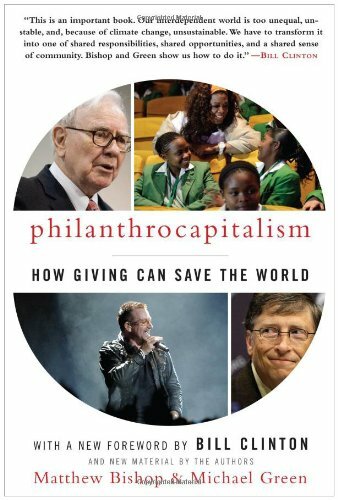 Proceeding from interviews with some of the most powerful people on the planetincluding Gates, Bill Clinton, Warren Buffett, Oprah Winfrey, and Bono, among othersthey show how a web of wealthy, motivated donors has set out to change the world. C. and meet President John F. Kennedy. Clinton attended Georgetown University after he graduated from high school, where he majored in International Studies. He interned for Senator William Fulbright of Arkansas, and with him became an opponent of the Vietnam War. Clinton won a Rhodes scholarship to Oxford where he studied for two years before attending the University of Arkansas Law School. There he was issued a draft letter and joined ROTC, but was never called up since he received a high number for the draft lottery. In 1970, Clinton entered Yale Law School and worked for George McGovern's presidential campaign in 1972. He graduated from Yale in 1973, and worked for a short time in D. C. as a staff attorney for the House Judiciary Committee. In 1974, Clinton entered his first political race, against Congressman John Paul Hammerschmidt, losing to the Congressman by 2 percent. In 1976, he was elected Arkansas Attorney General and in '78 ran for Arkansas Governor, winning the race 63% to 37%. He lost the reelection two years later because of Cuban refugee issues, but regained the title in 1982, and held it till he became President in 1993. Bill Clinton announced his run for President on October 3, 1991, and with Al Gore as his Vice President, took office on January 20, 1993 at the age of 46. He was one of the youngest men to hold the office of President and the first Democrat to be elected since 1976. As President, Clinton worked on health care reform, cut federal spending, created jobs, reduced the deficit and enacted the Assault Weapon Ban as part of the Crime Bill. He also helped Israel and Jordan achieve a peace treaty, enabled a peace accord between Israel and Palestine and contributed to the cease fire in Northern Ireland. Clinton stepped down from the Presidency in 2000 to make way for George W. Bush, and established himself in offices in Harlem, New York City, New York, while his wife was elected to the U.S. Senate, representing New York State.